Information about the 405 Flybridge will be posted on www.nimbus.se during 2015. Some equipment shown may be optional extras and some options may not be available. See www.nimbusboats.com for further contact information and additional technical information. The 2012 model range is equipped with Simrad plotters and navigation systems. 50 Please note that standard cushions for 2012 are white with blue decoration. 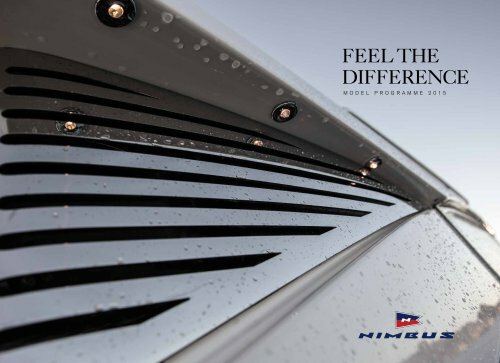 View the 360˚ VR tour at www.nimbusboats.com to view the latest images of the 2012 model range. Comfort is an important part of the Nimbus feeling, although this is not only about driving safely and comfortably in all weathers or about having plenty of room. It includes every ingredient put into the boat, from design, production method, selection of materials and crafsmanship to delivery, service and accessibility – our ambition is to make boat ownership and life aboard as comfortable as possible.